This is a note from an article that has been published in Geophysical Research Letters, 2011. An earthquake of Mw = 7.8 occurred on the 25th October 2010, SW of Pagai Island, Sumatra. The earthquake generated an unexpected very large tsunami on Pagai Islands with run‐up height of up to 8 m. Here we present seismic reflection and bathymetry images from the 2010 epicentral region acquired before the earthquake. 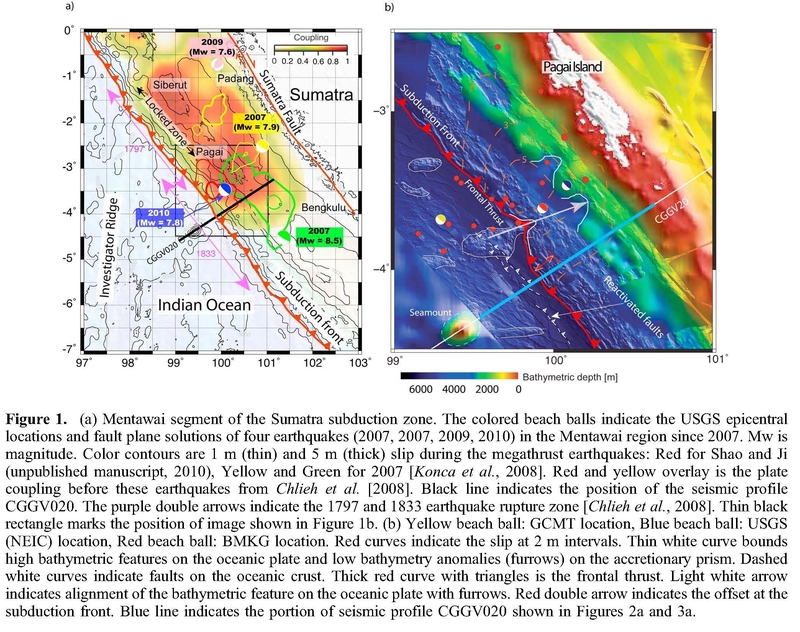 The authors found that the frontal thrust is the main active fault in this region and might have ruptured up to the seafloor at 6 km water depth uplifting the water column and producing a large tsunami. Tagged earthquake, fold-thrust, frontal thrust, frontal wedge, ma'ruf mukti, megathrust, Mentawai, pagai, rupture, subduction, tectonics of indonesia.